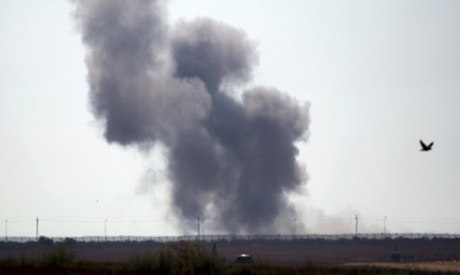 Not less than 22 Ansar Beit Al-Maqdis militants were killed in an air strike launched early Thursday in Rafah, North Sinai, by Egyptian air forces, reported Reuter’s Aswat Masriya. Military sources told Aswat Masriya that the 22 militants were killed in the early hours of Thursday by an Apache helicopter after information was received on a number of militants who participated in an attack against Egyptian security forces at a checkpoint in Sheikh Zuweid also Thursday. The sources added that security forces were sweeping the area for militants. Ansar Beit Al-Maqdis (ABM) is affiliated with Syria-based Islamic State group. On Wednesday, North Sinai witnessed the largest terrorist attack of its kind by ABM militants where the battles between the Egyptian armed forces and militants continued for several hours, especially in Sheikh Zuweid area. Battles between Islamist militants and the Egyptian army in North Sinai left at least 117 people dead — 17 army soldiers and 100 militants according to official statements by the Egyptian armed forces. We know that the Egyptian Army is strong and CAPABLE to DEFEAT ANYONE WHO WANTS to HARM US! BUT!Wouldn't be better to cooperate with the countries like Syria ,Iraq ,Iran ,Tunisia ,Turkey and Libya concerning ISIL??? We CANNOT DEPEND on the US and the UN because they are NOT TRUSTFUL and their interest is to keep the battle going on long as it is possible to keep the region in chaos.We must build an ARAB ARMY soon as possible! You might be right on one front that you can't rely on US/Europe forces and you have to fix your own problems yourselves,. But Arab Army? this sound like a joke, when did this actually work? Iraq war 1, Iraq war 2, Syria, Libya, Yemen ... ?